This month at New Vision, we’ve dedicated a lot of time and resources to talk about the importance of facing your fears. God did not create us to be controlled by fear but to rely on Him to keep our fears at bay and live up to our full potential. That said, it is important that we are able to identify the warning signs of pushing ourselves too far or too fast. If you are currently challenging a fear in your own life or have been given the opportunity to help someone else face their own, there are three zones you should be aware of to ensure your efforts will create progress instead of regression. As you read, visualize a dart board with three rings. We will start in the center and work our way out. Take time to honestly consider which of these three zones you find yourself in today. This zone is exactly what the title implies--comfortable. Without pushing ourselves, this is where we fall by default. Our heart-rate is low, our posture is relaxed, and our feet are likely propped up, completely at ease with the world. While this does not sound half-bad, it is important to note that very little growth happens when we are comfortable and unwilling to break a sweat. Is there a time and a season to step back and recharge, absolutely! 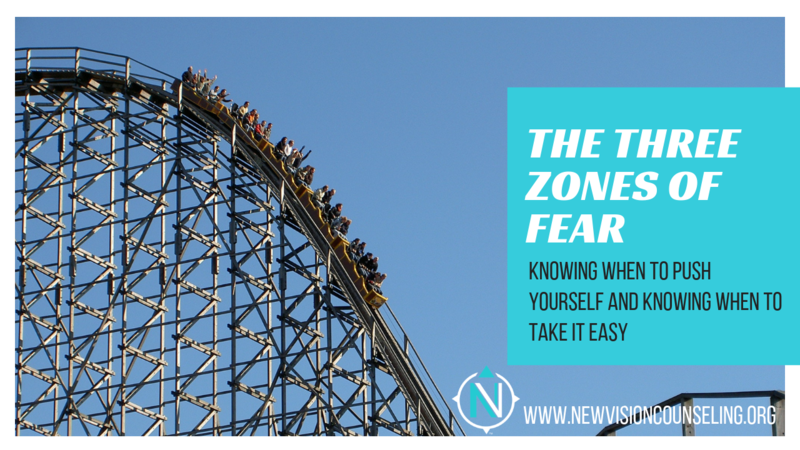 But should we aim to stay in this zone for fear of really pushing ourselves to face what scares us? I’m afraid not. In the dartboard analogy, we will place the comfort zone in the center, or bulls-eye. Taking a step outside of the center circle, we enter the second ring, called the grow zone. The grow zone is where we feel most alive! When we step into a new situation that makes us nervous, our posture becomes poised to react, our heartbeat quickens, and our minds become clear and attentive. Yes, this zone may make our palms a little sweaty, and we may find ourselves uncomfortable or unfamiliar with our surroundings, but the benefits far outweigh these slight inconveniences. You see, as we step outside the comfort zone and challenge ourselves to face what scares us, we become more confident and courageous and our comfort zone or bull-seye begins to grow! In the moment the task you face may seem like a challenge, but in the long-game, you are expanding the boundaries of where you feel comfortable and confident. Whenever possible, strive to be in the grow zone and just watch how you live as your attitude begins to change! The third and final ring of the dart board is the panic zone. This zone is dangerous because once we push ourselves past the limits of the grow zone, we are no longer able to grow because fear has taken over. Our hearts are pounding out of our chest, the mental clarity we found in the grow zone becomes jumbled, and our minds are not able to cope with the experience around us. While it’s relatively easy to identify when we’ve pushed ourselves to the point of panic, it is vital that we learn to recognize the signs of panic in those we are helping. Once we reach this zone, the panic zone begins to grow and the comfort zone in the center of the dartboard becomes smaller. If we are in the panic zone, we are providing more strongholds for our fears to take control which force us to run back to our comfort zone until we are able to calm ourselves to try again. We hope this analogy proves to be helpful next time you are in a new situation which makes you nervous. Here are some questions to guide you in self-reflection. Be honest with yourself and set safety barriers for to help channel you into the grow zone. Keep yourself from slipping back into the comfort zone and be cautious not to step too far into the panic zone. Which zone is your default zone? What area of your life do you need to step back into the grow zone? What signs does your body give you when you are about to slip into a place of panic?